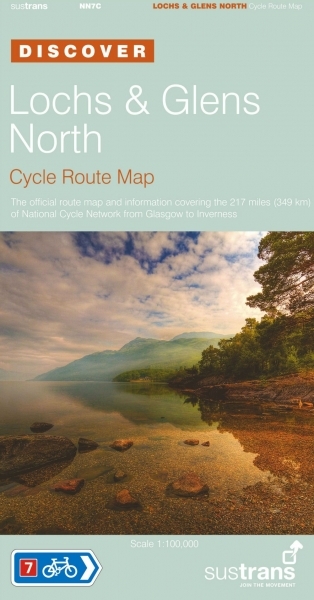 This area map shows the Lochs & Glens North cycle route and surrounding area over a series of separate map panels.Lochs & Glens North from Glasgow to Inverness is a beautiful route passing through two National Parks: Loch Lomond and the Trossachs National Park with lochs, forests and bustling towns, and the Cairngorms National Park covering the UK's largest mountain range. A traffic-free path takes you from Glasgow, along the rivers Clyde and Leven, to the shores of Loch Lomond. The route takes in the lochs of Drunkie, Venachar, Lubnaig, Earn and Tay. Glen Ogle with its old railway viaducts is one of the highlights of the route.This full colour map based on Ordnance Survey data shows clearly mapped cycle routes on traffic-free paths, quiet lanes and roads, with easy to read contours and route profiles. Also features detailed inset maps for the major towns and cities and detailed day ride descriptions.